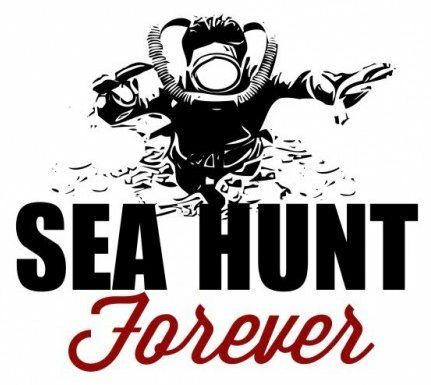 Sea Hunt Forever Event is Coming Soon! - On March 19th and 20th at Silver Springs Florida, there will be underwater re-enactment of Scenes from Sea Hunt episodes for the viewing pleasure of 5,000-10,000 guests in glass bottom boats. The divers are all familiar characters and avatars from the Vintage diving community. SwimJim Bach, Sea Hunt Jerry Lang, Antique Diver Bill Tucker, Terry Stevens, Karl Gehring, Luis Heros, Rob Studnicka, Bryan Pennington and many more you would recognize from the forums of VDH, VSS, and Scuba Board. As you might expect, the chance to dive in this event is a treasured privilege. First of all because no divers are allowed at Silver Springs anymore. And second because most of the underwater scenes from Sea Hunt were filmed in the crystal clear waters of Silver Springs. (Tarzan and Creature from the Black Lagoon filmed there too). 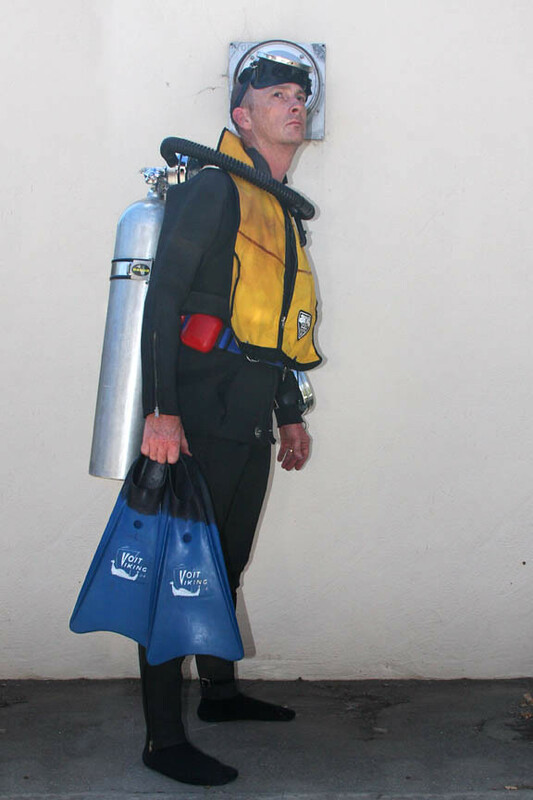 - While the diving cast is already set and was done so by invitation, everyone who is into vintage diving is welcome to come and see the show as well as stop in and say hello to the divers. - I was very fortunate to be considered for an alternate cast member and received my invitation just last week when someone else had to bow out. What a thrill! I still can't believe it. - I was sent a very strict equipment list... This is actually an historical re-enactment and the equipment must be accurate to what was used on the Sea Hunt TV Show. I'm close to having what I need but I'll be needing a few more items to be accurate. I'd come if the dollar was better, and I don't have a piece of vintage gear yet... Looking at a DAAM reg. Eban, you are going to have a blast. 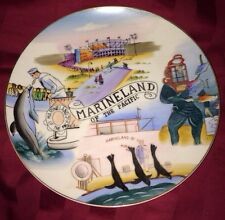 I was a lucky enough to have been a member of the 50th anniversary of the end of the Seahunt show a few years ago and am a cast member of this event as well. The group of divers given the opportunity to dive in the event are dedicated DH divers with lots of DH experience.. My local dive buddy and myself have our photos in a Canadian dive mag doing the hose cutting fight scene at the last event and let me tell you, the bubbles coming out of the hose are not fake, if you cut an exhaust hose of a reg with a reasonable venturi, the reg goes into a full blown free flow…..which reminds me, I need to modify my regs so they are not so responsive to the venturi…..you waste a huge amount of gas that way. I encourage any of you who are close by to come over to the springs and say hello. - The rules are not just that the equipment be "vintage"... It also has to have appeared on Sea Hunt at least once. Thanks Herman. Yeah, I feel awfully lucky, too. - This Voit VR1 single stage regulator looks like brand new. It's actually a FAUX VR1... I built it from parts. The distinctive Voit front can came from Sea Hunt Jerry. He took it off a destroyed Voit NAVY and it had holes drilled in the face. I got like-new USD Mistral guts and a back can from Rob at Scuba Museum. I stripped all of the old chrome and nickel down to bare brass and sent it off for repair and re-chrome. Even the holes got fixed. - I got an authentic reproduction Voit Lung VR1 label from A&D Adventures. The regulator guts were all serviced with a new high pressure seat, silicone diaphragm, and other parts from VDH... It works like brand new. - But the hoses kind of threw me off task... The old style green hoses with straight mouthpiece and steel hose clamps... They're authentic and historically correct. But I didn't like the feel nor the looks of them. I made them up from brand new materials just in case... But, I ended up putting a more modern curved mouthpiece and gray hoses on it. I dive this regulator at least once on every dive trip and I love it. - But now it's time to use the green hoses and straight mouthpiece... Because that's what the Voit VR1 regulators look like when Mike Nelson dives them on the Sea Hunt TV show! - Sea Hunt Forever... Yeah! 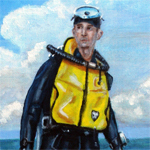 Eb, yeah, I know in this image not all the gear is right, I took it for a study for a painting, but since then I have all Sea Hunt-period Healthways gear! How fun would it be to show up with a Divair? Well, I don't have much in the way of Voit equipment for a Sea Hunt dive. Most of mine is various double hose regs, but not built around that show. I do admire those who have it though. I followed the link above, to the first Sea Hunt episode, and noted that Mike Nelson was in that episode using: DESCO mask, USD Jet Air regulator and USD tank/harness, full-foot Rodine (sp?) fins, and a black oval mask. I really like that episode, and noted that the jet in the footage that was "ditching" had some unique attachments to the underside of the fuselage. It appeared to me (being ex-USAF) to be making a water landing. So I decided to look up and see whether there was such a thing. I googled "1958 delta-winged jet water landing" and guess what, there was such a thing. The Convair F2Y Sea Dart was a unique American seaplane fighter aircraft that rode on twin hydro-skis for takeoff. It flew only as a prototype, and never entered production. It is the only seaplane so far to have exceeded the speed of sound. I'm about half-way through this episode, and will watch the rest at supper time. Really cool lookin' plane, but they were deadly to their pilots! I'm taking a little break from my book I'm writing, yeah DD, another book! You are writing a book JB? Have you published the one before? Wow! I could never write a book... I have the phrase "Ants in my pants". Jaybird, this footage is intriguing. 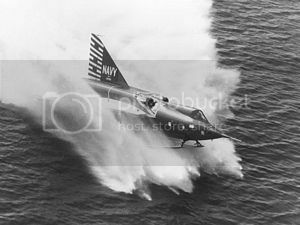 Most of the jets of the 1950s were pilot traps, ergonomically, and took a really highly trained pilot to fly them. I've done a lot of work in ergonomics, and much of what we have now comes from loosing a lot of pilots during WWII, Korea and in the first jets. It is interesting to me that a simple scene from Sea Hunt would lead to discovering an aircraft, the Sea Dart, that I had not heard of before. The Sea Dart first flew on April 9th, 1953. It took years of design work and testing to come up with this aircraft, which never did get into production. It started in 1946, just after I was born! The models in the second video were intriguing, and the designers skipping it in a wave tank really gave the design a workout. While not diving, Sea Hunt's first show sparked an interesting discovery for me. Thanks! PS, concerning your book, have you seen the program, Scrivener, for book writing. My daughter-in-law showed me this, and it is what I'm currently using for my memoir (link included). why does this have ANY significance?!?!? 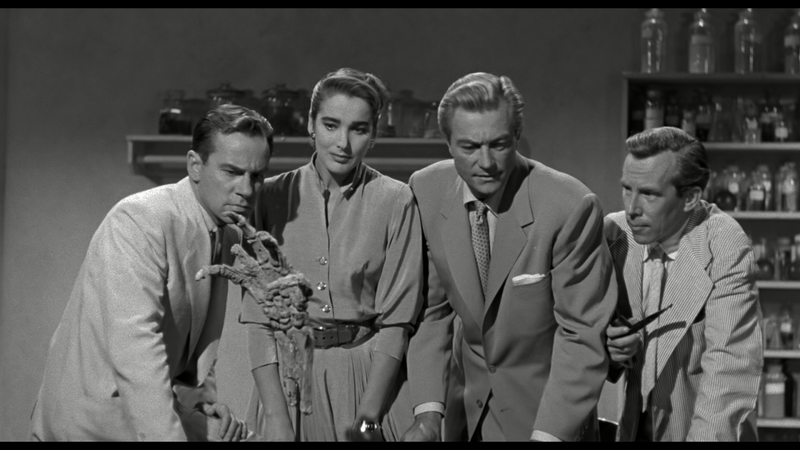 He was in "The Creature from the Black Lagoon"!